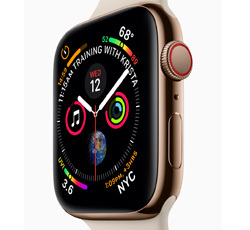 The first foray of Apple into the wearables Apple Watch has already brought us many surprises, with luxurious finishes, dazzling colors and different brands and sizes. However, that doesn't mean it's a thing without good apps for Apple Watch (Series 4). All the possibilities, from social networking to health and fitness tracking that it has largely depend on the built-in and third-party software. Any best apps to help you justify the price of Apple Watch, which as we all know, does not come cheaply? Here we have combed through all the Apple Watch (Series 4) apps and list the best iOS apps. Shazam is a popular music identification service and now it has been integrated into Apple Watch (Series 4). Serving as good music detection software, it captures a song that's playing nearby through the in-built microphone, checks it with a central database and send back the information of the song on the display, like the title, singer, lyrics, album, publish date etc. Shazam is the most-demanded one, together with Spotify. Having get the title of a song by tapping the above music detection app, now you may wonder if it can play music. As most Apple Watch features are be tethered to an iPhone, there is standalone one: in case you’re out on a jog without you iPhone, you can still listen to the music with theBluetooth headset. Based on this feature, Spofity is expected to come as one of the most-anticipated big apps. If it's possible, Spotify can easily be one of the best Apple Watch apps to enjoy songs. Tips: Yes, the ability of Apple Watch to listen to music directly from your wrist to the connected Bluetooth headphones is a big win for guys who hit the gym a lot. But the question is, what if you want to listen to the music library than Spotify online? How to put songs into Apple Watch? Well, just turn to MacX Video Converter Pro to download music from Spotify and other sites and convert it into Apple Watch supported formats. The Facebook apps perfectly fits the Apple Watch screen to allow users catch up with friends, view the trending topics, post their status etc. Just use the Digital Crown on the side, then you can scroll the new feeds. Also other social iOS apps on Apple Watch include the widely-used Twitter, huge Chinese app WeChat, Instagram and Pinterest. CNN is also announced as one of the best apps for Apple Watch (Series 4) that users can experience. This free software offers breaking headlines across 12 personalized categories, from Health to Entertainment and Politics, allowing users to catch up the latest information at a glance. Uses can tap the story and choose to save it or continue reading on the phone. Other similar free apps that bring the latest news are NYTimes, Yahoo News Digest etc. One big Apple Watch feature is the emphasis on fitness and health. With various sensors, it can tell your heartbeat, activities and steps. Beside the built-in fitness feature, various other apps are available for Apple Watch. Like the Strava, which can track the real-time stats during your ride or run. But Fitness Spades may come as the one of the top Apple Watch apps on fitness as it turns your workouts into a game to keep you motivated. Fandango announced that its popular movie ticket buying service will be featured in a full-fledged Apple Watch app, which according to its president, will continue to build award-winning iOS apps that leverage Apple's latest technologies including Siri and Passbook, enabling fans to easily discover new movies, get the latest trailers, information and buy tickets. Once you've purchased the movie tickets through this ticket-buying app, it can conveniently display the time, theater location and other movie information. A security app for Apple Watch to make sure if door in your house are locked and check the security cameras from your wrist, so as to keep an eye on everything at home when you are out. A good note-taking app for Apple Watch, with which you can glance your reminders, dictate notes, tick off items, search notes made nearby, all over your wrist. May be the best Apple Watch software for iOS on public transport. It tells you the best route when taking bus or subway and even vibrating when you reach your stop, giving instructions to navigate the public transport. It allows users to check in for flights, and show other gate and boarding information, like if the flight is on time, how far away your gate is etc. Uber's Apple Watch app allows users to request a car, check the distance on map, show a tiny picture of the driver's face and car, and tell your the car's number plate. All the best iOS apps on Apple Watch are must-haves to leverage its features and justify its price, but they won't be the only ones headed to your wrist. In addition to these top apps we selected above, a whole bunch more are on the way. You can access and download more Apple Watch software on your iPhone. Which apps will be your favorite ones, that may need your own experience.